Battle went on to give an additional 223 performances over a career of 16 years, specializing in the soubrette roles of the repertoire. However, the soprano’s celebrated Met career was overshadowed by her very public firing by then General Manager Joseph Volpe during rehearsals of Donizetti’s La Fille du Regiment in 1994. The details of that firing and the often erratic/destructive behavior that plagued Battle for a number of years have become operatic folklore and don’t require repeating here. Whatever demons haunted the soprano are known only to her. But at the time of her sacking she was seemingly still at the height of her powers. And those powers were estimable. I heard Battle in all of her Met assignments, and the voice at its best was a model of purity of tone—an exquisite crystalline sound that made her the ideal Sophie and Zdenka in Strauss’s operas and an outstanding Mozartean. Her palpable sense of joy when singing—and formidable coloratura—made for memorable assumptions of Cleopatra, Rosina and Adina. If she was not the most probing of actresses, she instilled her roles with a winning openness and honesty. Yet for me, perhaps her greatest performances in New York were not featured at the Met, but two now legendary Carnegie Hall evenings: the 1985 concert of Handel’s Semele, and the 1990 Spirituals in Concert recital with Jessye Norman. 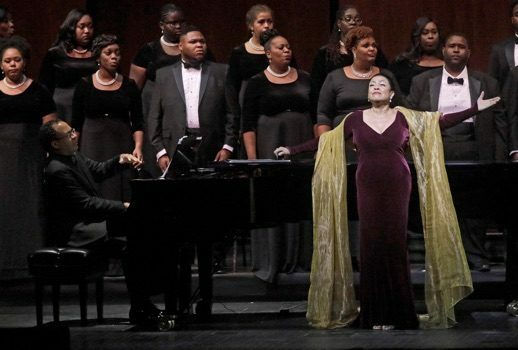 In the former, Battle gave a vocal performance that was nothing short of spectacular, and in the latter, the soprano delved into depths of emotion I rarely encountered in her operatic portrayals. But those triumphs were decades ago. Why would the now 68-year-old soprano agree to return to the scene of the “battle”? Retribution? An occasion to end her Met career on her own terms? Or simply the opportunity to allow her many New York fans a proper sendoff? Any questions about her ability to captivate an audience were quickly allayed. Battle was not here simply to be venerated. She was here to present a thoughtful, fully committed recital. And she did. It would be naïve to expect that Battle’s voice would not show the traces of time. I had anticipated that the voice—always sunshine-filled—might have become patinated with more autumnal colorings, but that was not the case. While there is certainly a diminution in range and volume, that unmistakable Battle sound remains remarkably intact. Her rendition of “City Called Heaven” was simply luminous; the Spiritual “Hush” both seductive and comforting. If some of the more exuberant offerings would have benefited from a larger sound, she resourcefully used her voice in its current state to great effect. In the program (three hours and fifteen minutes with one intermission) inspired by the journey from slavery to freedom via the Underground Railroad, Battle was joined by her principal pianist Joel Martin, special guests: Wynton Marsalis, Trumpet; Cyrus Chestnut, Piano; Riza Printup, Harp; the Voices of the Underground Railroad Choir; and Jussie Smollett and the legendary Cicely Tyson as Narrators. The plentiful musical selections were interspersed with dramatic readings from the writings of abolitionists Frederick Douglas and Harriet Tubman as well as Dr. Martin Luther King, Jr., Robert Hayden (poet and essayist), and Dr. Charles Blockson (author and historian). While Battle was clearly the star attraction, she was generous in sharing the spotlight with her fellow performers. The scintillating and virtuoso contributions of Mr. Marsalis and Mr. Chestnut in an exhilarating, roof raising “Wade in the Water” proved one of the highlights of the first half and prompted the first, but not last, mid-performance standing ovation of the afternoon. Special mention must be made to the exemplary Voices of the Underground Railroad Choir under the direction of Stephanie Fisher and Rachel Blackburn. The first half of the concert found the choir in brilliant form, but in a more supportive role. In the second half while the soprano momentarily relinquished the spotlight, the choir and many of its member’s were confidently front and center. I would be remiss if I didn’t report that Battle exhibited some of the idiosyncrasies that have afflicted her in the past. In addition to the 35-minute delay at the start of the concert, the soprano frequently cued her pianist, conducted the choir, dictated when the choir should sit or stand, had a pantomime conversation with someone in the front rows of the orchestra, and when the audience began to rhythmically clap at one point, she made it abundantly clear they should hush. Yet rather than it seeming off-putting, it came across as somewhat endearing. But that should not be the takeaway from this concert. While there were moments of absolute joy and exhilaration in the first half, three moments in the second half of the concert are the ones that linger. The first was Battle’s opening rendition of “Calvary” with Ms. Printup at the harp. The other two were her penultimate and final encores: an a cappella version of “Were You There, When They Crucified My Lord,” and “I Hear Music In The Air” accompanied again by Printup at the harp. In those moments the audience collectively held its breath, the years faded away and time, as the saying goes, seemed to stand still. Sunday’s concert demonstrated that the soprano still has the voice, charisma and passion to write a more fitting final chapter to her legacy. If this was the last time New York audiences have the opportunity to hear the soprano, her valedictory appearance was nothing short of triumphant, and one, I dare say, that may well become legendary. But the concert also proves that Battle may yet have even more to say. If and when she is ready, I know I will be there.